While it doesn’t have the name recognition of Newfound Gap or Clingmans Dome, I think the Oconaluftee Valley Overlook is the best view in Great Smoky Mountains National Park. It actually reminds me a bit of Tunnel View, the most popular viewing spot in Yosemite National Park in terms of the view it offers. It’s certainly not as iconic as Tunnel View, but I think it’s every bit as beautiful. If you compare this photo to the photo of Yosemite linked to above, you’ll notice some similarities in view, but not in exposure. That was a 339 second exposure (at ISO 100 and f/6.3) taken before sunrise, this shot is a 26 second exposure (at ISO 500 and f/4) taken at 3:03 a.m. Granted, the ISO and aperture here lend to a shorter exposure, but this shot was also taken in the middle of the night. The key difference? The light from the moon! It was a rare full moon this particular night called a “Hunter’s Moon,” and that sucker was bright. I’m not sure if it’s because I was in the clear sky of the mountains or what, but it felt almost like bizarro-daylight. By contrast, the moon wasn’t around when I took that shot of Yosemite, and I couldn’t even SEE the valley there with my naked eye. You might wonder why I was up at 3:03 a.m. taking photos of some trees (or you might not…it’s not exactly out of character for me). I wanted night photos of Great Smoky Mountains National Park, and I had largely struck out the previous night at Clingmans Dome. That previous night, I ended up sleeping in my rental car at Clingmans Dome, mostly because it was the logical thing to do. I left Indy for Great Smoky Mountains National Park on Friday after work and drove until I got there after midnight, some 6 hours later. I went directly to Clingmans Dome (as planned), and wasn’t done up there until around 2 a.m. It would’ve taken another hour to get back to a campground and get my tent set-up, leaving me maybe an hour to sleep before getting up to drive back for the sunrise, so it made more sense to just sleep in the car at the Clingmans Dome parking lot. Since I struck out that previous night, I decided to do more night shooting on Saturday night, this time lower in the valley. Unfortunately, at 10 p.m., the sky was a sea of clouds, so I had to wait. And wait. I could have nixed the idea, going to a campground and getting an ample night’s sleep, but I really wanted the night shots. So, I set my alarm for 1 a.m. and dozed off in the car. It was still cloudy at 1 a.m., but I decided to move the car to the Oconaluftee Valley Overlook because it offered a spectacular view from the parking area. I hadn’t previously parked there because I wasn’t sure it was 24-hour parking, and I’m not sure whether sleeping in a car is “frowned upon” there. At that point, I figured that if I had to sleep in a compact rental car in the cold, at least I was going to have a preferred view! When my alarm went off again around 3 a.m., the sky was clear and bright, perfect for shooting (although probably not for star trails). That’s when I captured this shot. A popular saying among photographers is “f/8 and be there,” which suggests that technical settings aren’t so important as showing up. While I think this is reducing things to too simple of terms, there is a basic truth in it. While I encountered hundreds of people taking photos during the overcast (far from ideal) daytime conditions, I didn’t see anyone else out at 3 a.m. Sunrise was more popular, but still, not nearly as many photographers (and I’m talking people actually interested in photography, not tourists with cell phones) were out for it as were out later in the day. A big part of photography is being there. If you make the effort to be there for the best conditions, you put yourself in a position to do well. It’s the drive to get up early or stay out late. The idea that if you’re going to play, you’re doing it to win…not just going through the motions or hoping for that coveted participant award. Photographed with a Nikon D600 and the Nikon 14-24mm f/2.8 Lens. I shot it in bulb mode with a tripod and remote, which meant guessing at the exposure. The first couple of times, I guessed way too high on the exposure, and my shots were blown out (blown out star-shots…that’s a first!). While you can use the exposure meter when shooting in bulb mode, I prefer to use intuition as it’s usually more accurate. In this case, the meter was more accurate. Processing was straightforward (I know I’ve put that for several shots recently–I have a couple upcoming photos that have more tricky processing methods; sorry if you come here to learn more about processing!) with the big thing trying to strike the balance between depth established through blacks and contrast (which also made the trees less distinct) and seeing as much detail as possible in the trees. As I said above, this was a BRIGHT scene. Going with more blacks and contrast actually ended up giving the sky a deeper shade of blue and making the stars more distinct, so I opted for that. It was actually pretty easy to see detail in the trees and stars that evening with the naked eye, so unlike some of my photos that make visible things that the eye can’t see (like the Yosemite shot), this is pretty much true to life. 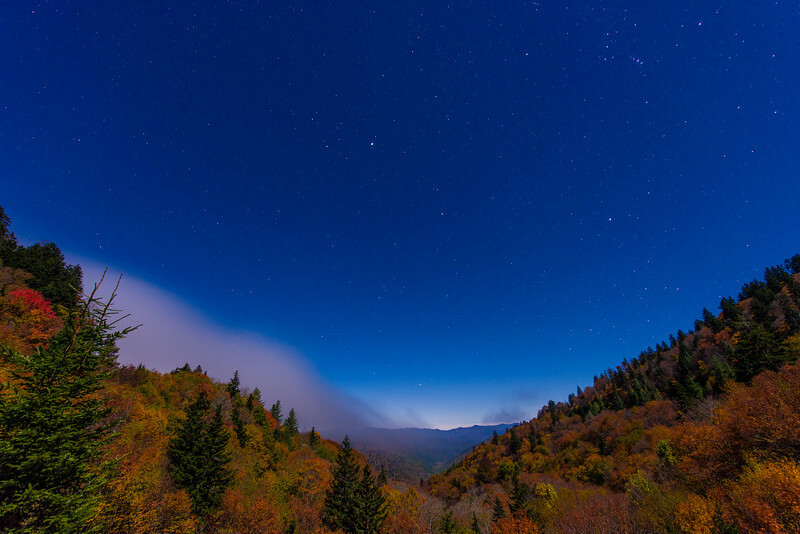 What do you think…was it worth sleeping in the car to get this (and other) shots of Great Smoky Mountains National Park? If not, would it change your answer if you also knew that I saved fifteen whole dollars by not having to pay for a camp-site?! Hearing from you is half the fun, so please share your thoughts in the comments! I love this photo!! Great work! I grew up in Knoxville, which is 45 min away from the Smokies, so we saw views like this quite often. Sadly, I took them for granted and didn’t really appreciate them until I couldn’t see them all the time when I moved to Nashville. I truly believe that East TN has some of the best scenery in this country!! We love GSMNP, but never thought of getting a night shot there! Really nice job on this photo! The area there is rarely clear, and you were really blessed with perfect weather. We live about 8 hours away in Norfolk, Virginia, but we usually visit the Smokies at least once a year on vacation. Lots of waterfalls there, and the Cades Cove historic area there is particularly scenic, with great dawn views and lots of wild animals and historic sites to see. Thank you for all the photo tips, we found this site from your Disney site, which we check out often. We are heading down there this coming week with our family and will be using many of your photo tips to bring back some much improved photos. Love both your sites, and thanks for your labor of love. (By the way, on your recommendation, I bought the Understanding Exposure book. Best money I ever spent on my photography.} Many thanks! Very nice! I didn’t realize that you are closer to GSMNP than I am, even though I am in the same state. It would take me about 8 hours to drive there. I haven’t been there in almost 10 years, but this makes me think about going back. Any particular reason you chose to use ISO 500 instead of a longer exposure at ISO 100? I do like the distinct stars here instead of star trails, so I was guessing that might be it. I assume you’re on the far west side of Tennessee, then? I was surprised by how close we are to it. Yes, I’m just outside of Memphis. I forget how long Tennessee is until I try to drive it. I love the color in that photo, everything is very crisp and clean also. What was the shutter speed on this? I love the colors you got here and the almost perfect “V” shape of the valley. In a National Park, the bigger concern is probably animals. I saw a number of coyote (generally no concern with them) and there are a lot of bears in GSMNP. As far as Zodiac killers go…I don’t think they’re quite as common. Now, I wouldn’t go into the dodgy side of town late at night with my camera gear for the exact same reason. No longer is the risk quantifiably low there.